Definition at line 36 of file wbemprox_private.h. Definition at line 39 of file wbemprox_private.h. Definition at line 40 of file wbemprox_private.h. Definition at line 41 of file wbemprox_private.h. Definition at line 38 of file wbemprox_private.h. Definition at line 105 of file wbemprox_private.h. Definition at line 43 of file wbemprox_private.h. Definition at line 69 of file wbemprox_private.h. Definition at line 98 of file wbemprox_private.h. Definition at line 45 of file wbemprox_private.h. Definition at line 29 of file wbemprox_private.h. Definition at line 389 of file table.c. Definition at line 460 of file query.c. Definition at line 348 of file table.c. Referenced by create_record(), and grab_table(). Definition at line 303 of file table.c. Referenced by execute_view(), and free_table(). Definition at line 1020 of file class.c. Referenced by class_object_SpawnInstance(), enum_class_object_Next(), get_object(), get_qualifier_value(), wbem_services_ExecMethod(), and wbem_services_GetObject(). Definition at line 440 of file query.c. Definition at line 818 of file class.c. Referenced by class_object_GetMethod(), class_object_NextMethod(), process_get_owner(), reg_create_key(), reg_enum_key(), reg_enum_values(), reg_get_stringvalue(), security_get_sd(), security_set_sd(), service_pause_service(), service_resume_service(), service_start_service(), and service_stop_service(). Definition at line 33 of file query.c. Definition at line 237 of file class.c. Referenced by destroy_record(), free_row_values(), and to_array(). Definition at line 48 of file query.c. Referenced by free_query(), and parse_query(). Definition at line 195 of file class.c. 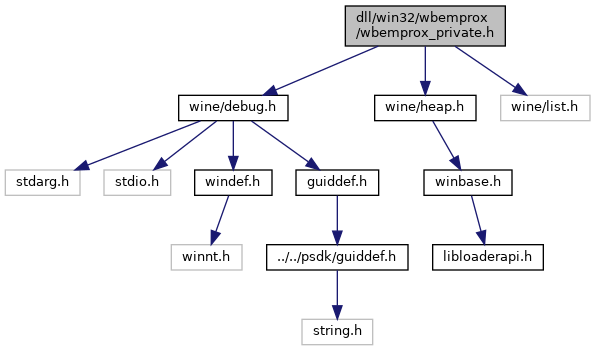 Referenced by enum_class_object_Clone(), exec_query(), and wbem_services_ExecMethod(). Definition at line 364 of file query.c. Referenced by eval_binary(), eval_unary(), execute_view(), and match_row(). Definition at line 471 of file query.c. Referenced by async_exec_query(), create_instance_enum(), create_qualifier_enum(), create_signature(), test_associators(), test_select(), and wbem_services_ExecQuery(). Definition at line 405 of file query.c. Referenced by exec_query(), and wbem_services_ExecMethod(). Definition at line 319 of file table.c. Referenced by create_signature_table(), and free_table(). Definition at line 450 of file query.c. Referenced by release_query(), and wbem_services_ExecMethod(). Definition at line 281 of file table.c. Referenced by clear_table(), fill_cdromdrive(), fill_compsys(), fill_compsysproduct(), fill_datafile(), fill_directory(), fill_diskdrive(), fill_diskpartition(), fill_ip4routetable(), fill_logicaldisk(), fill_networkadapter(), fill_networkadapterconfig(), fill_os(), fill_physicalmemory(), fill_pnpentity(), fill_printer(), fill_process(), fill_processor(), fill_service(), and fill_videocontroller(). Definition at line 327 of file table.c. Referenced by class_object_Get(), class_object_Put(), eval_propval(), eval_unary(), get_propval(), and put_propval(). Definition at line 258 of file table.c. Definition at line 406 of file table.c. Definition at line 448 of file services.c. Definition at line 1067 of file query.c. Definition at line 840 of file query.c. Referenced by class_object_Get(), and class_object_Next(). Definition at line 47 of file table.c. Definition at line 94 of file table.c. Referenced by eval_propval(), eval_unary(), free_row_values(), get_method(), get_propval(), and get_value_bstr(). Definition at line 149 of file table.c. Referenced by build_proplist(), get_body_text(), and get_propval(). Definition at line 354 of file table.c. Referenced by create_view(), and get_method_name(). Definition at line 232 of file wbemprox_private.h. Definition at line 3601 of file builtin.c. Definition at line 628 of file query.c. Referenced by class_object_Next(), count_properties(), get_properties(), get_propval(), and put_propval(). Definition at line 489 of file query.c. Referenced by class_object_Next(), get_properties(), and get_propval(). Definition at line 2086 of file wql.tab.c. Definition at line 66 of file process.c. Definition at line 1046 of file query.c. Definition at line 100 of file reg.c. Definition at line 199 of file reg.c. Definition at line 309 of file reg.c. Definition at line 392 of file reg.c. Definition at line 466 of file query.c. Referenced by enum_class_object_Release(), and exec_query(). Definition at line 343 of file table.c. Referenced by destroy_record(), destroy_view(), and get_method_name(). Definition at line 133 of file security.c. Definition at line 188 of file security.c. Definition at line 80 of file service.c. Definition at line 125 of file service.c. Definition at line 194 of file service.c. Definition at line 239 of file service.c. Definition at line 209 of file table.c. Referenced by hex_data_state(), and put_propval(). Definition at line 797 of file query.c. Referenced by control_service(), create_key(), enum_key(), enum_values(), get_owner(), get_propval(), get_stringvalue(), security_get_sd(), security_set_sd(), start_service(), to_bstr_array(), to_byte_array(), and to_i4_array(). Definition at line 996 of file query.c. Referenced by put_propval(), and record_set_value(). Definition at line 765 of file query.c. Referenced by get_propval(), and record_get_value(). Definition at line 743 of file query.c. Referenced by get_propval(), record_get_value(), and to_safearray(). Definition at line 215 of file wbemlocator.c. Definition at line 250 of file qualifier.c. Definition at line 913 of file services.c.